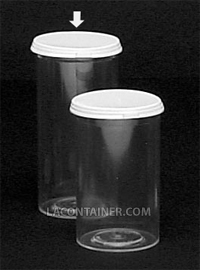 Polystyrene containers for packaging rhinestones, crystals, embellishments and sequins. Many products need to be clearly seen to be appreciated. Polystyrene containers are the perfect solution for packaging rhinestones, crystals, metal embelishments and sequins. These containers have straight walls which are perfect for adhesive backed foil labels or transparent vinyl labels. The clear choice for attractive arts and crafts product packaging. 38.1mm Dia. X 84.1mm Ht. 1 1/2" Dia. X 3 5/16" Ht.